2007 marks one century of Biochemistry taught at McGill. In the year 1907, Dr Robert F. Ruttan was appointed the first Professor of Biochemistry!! This is certainly a reason to celebrate! 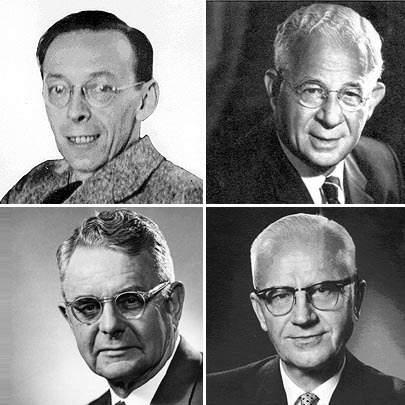 This Article is an abridged version entitled "A Sixty-Year Evolution of Biochemistry at McGill University", Scientia Canadensis, V. 27 (2003) pp. 27-84 published by Rose Johnstone, Professor Emeritus, McGill Gilman Cheney Chair in Biochemistry. 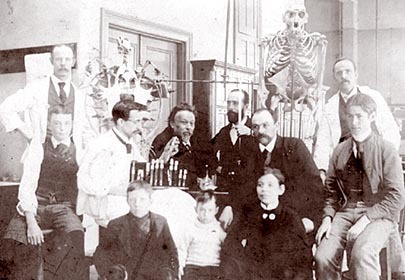 Biochemistry at McGill began with members of the Medical Faculty teaching chemistry to medical students enrolled in the fledgling medical school. As the University grew to include other disciplines, chemistry was also taught to students enrolled in other Faculties by the same core of people. The Chemistry Department at McGill was established at least 20 years before the appearance of a Department of Biochemistry. Ironically, the individual who became the first Chairman of the Department of Chemistry, Robert F. Ruttan, was a physician who had been hired to teach chemistry to medical students. The instruction of chemistry to medical students now fell under the wing of the Chemistry Department. Ruttan was named Professor of Biochemistry in 1907. He was the first person to hold this title. It was only in 1920 that the Department of Biochemistry was finally launched. The first Chair of our Department was a Fellow of the Royal Society of London, and a distinguished scientist with an international reputation. He was also the founder of the National Research Council of Canada and its first President. The NRC was established to give the Government of Canada advice on scientific matters of national consequence. Later it also became the first government body to provide financial support for basic research at Canadian Universities. New research on origins of life credits this long-dead Canadian. 2012 Feb. 21. J.B. Collip, the second Chairman, had been Macallum's first graduate student in Biochemistry at the University of Toronto. Macallum was no doubt instrumental in attracting Collip to McGill. Collip's name is forever associated with the isolation of insulin. While not named in the Nobel Prize for its isolation, his skills and insight into protein chemistry were instrumental in making insulin preparations safe for human use. Under Collip, the Department acquired a wide international reputation for hormone isolation, purification and quantification. Collip launched the first Endocrine Research Institute at McGill in 1941. In 1941, D.L. Thomson, the most erudite member of the Department's teaching staff, was named to the Chair. Thomson held in the Chair until 1958, longer than any other incumbent did. He was adored by generations of students for his charismatic and exciting exposition of events evolving in biochemistry worldwide. Because of him, many were inspired to follow biochemistry as a career. Three major foci of research evolved in the Department and in the Research Institutes in clinical departments with affiliations to the Department under Thomson, namely, Metabolism, Endocrinology and Neurochemistry. Major modernization of the Department, reflecting the changes in approach to studying Biochemistry worldwide, was introduced when A.F. Graham was appointed to the Chair in 1960. Graham was the first chairman whose major expertise was in nucleic acids and the "life" of viruses. Since his era, the central aspects of Molecular Biology have been at the core of the research undertaken in the Department and in the curriculum at the graduate and undergraduate levels. Although Biochemistry at McGill was a late arrival compared to the sister Departments of Bacteriology, Botany, Physiology and Pharmacology, its late start would not be deduced from its position today. The Department has achieved research prominence, receives excellent support by public funds and attracts many undergraduate and graduate students from Canada and abroad. The achievements of its graduates and the international recognition of its scientific staff have cast the Department in a bright light compared to other schools inside and outside Canada. No fewer than sixteen of our Ph.D. graduates have served as Chairs of Biochemistry, ten of them in Canada. In addition, no less than eight graduates have been -or are- directors of Research Institutes. Brigitta Askonas, one of our graduates, became Dame of the British Empire, and another, Ronald Cape, founded the Cetus Corporation, where the polymerase chain reaction was introduced. A third, A. Schally, was awarded the Nobel Prize for work initiated at McGill. Since awarding the first Ph.D. degree in 1925, our Department has granted over 700 Master and Doctoral degrees to biochemistry students. At present, the Department is entering another era in collaboration with other Departments at the University, expanding into the areas of Proteomics and Genomics. The latter will become part of the fundamental mandate in training and education, enhancing the prospects and opportunities of students and Faculty members of the Department.